The chapel was perfectly decorated and the guests were all getting seated. Sidney, Marc Andre, Craig, Colby and Troy were all in a waiting in a small room off to the side of the front of the chapel. Finally they were told to come in and get ready because it was just about time to start. Sidney and all the guys walked in and both Sidney's and Carrie's moms were sitting holding Ava and Aaron. Meanwhile Carrie was just arriving at the chapel and getting out of the limousine. Vero, Taylor, Melissa and Melanie were helping Carrie get situated and ready to walk down the aisle. The girls made it into the entry way of the chapel but no one inside the chapel could see them just yet since the doors were closed. "Here we are Carrie and now its your big moment" Vero said to her as all the girls smiled. "You all have been so wonderful with everything and I don't know how to thank you for being here for me and being my friends. I love all of you so much" Carrie said as tears formed in her eyes. They all gathered for a quick hug and then they situated Carrie veil and dress and then it was time to open the doors for the bridesmaids to walk down the aisle. Then the doors were closed again and Carrie and her dad got ready for their moment. "Carrie you are my little girl and I am so proud of you. I know you and Sidney have been through so much and you guys love each other so that is all I want is for my little girl to be happy and healthy. Oh and I have to say that you are an amazing mother of my grandchildren too, darling" Mr. Addison said as he gave Carrie a hug. "Thanks Dad. All I ever wanted is to be happy and I am with Sidney and the twins. I am happy too that you are proud of me. I have tried to be the best daughter for you and mom and you saying that you are proud of me, makes me realize how lucky I am" Carrie said smiling at her dad. The doors opened to the chapel and Carrie and her dad walked down the aisle towards Sidney. Carrie looked at Sidney and could not believe how gorgeous he looked. In his tux and everything about him was perfect and just Sidney. Sidney was watching Carrie walk towards him and he could not believe at how beautiful she looked. She was perfection in that dress and her hair was all done with curls and a tiara that sparkled. Carrie's dad gave her hand to Sidney and he said, "Take good care of her for me Sidney". "I will sir" Sidney said as he nodded to her father and then took Carrie's hand and smiled at Carrie. Carrie blushed and smiled at Sidney and then they turned their attention to the minister. "Dearly beloved we are gathered here today to celebrate this special day with Carrie and Sidney" the minister said and then continued with a special marriage prayer, "We thank You, O God, for the love You have implanted in our hearts. May it always inspire us to be kind in our words, considerate of feelings, and concerned for each other's needs and wishes. Help us to be understanding and forgiving of human weaknesses and failings. Bless our marriage, O God, with peace and happiness, and make our Love fruitful for Your glory and our joy both here and in eternity". "Sidney has something he wishes to say now" the minister said. "Carrie wow we known each other for a while now. We have been through so many experiences that have made me a better person thanks to you. The main thing is the day you told me we were having a baby which turned into twins. I love being a father and the two of us working together to raise Ava and Aaron. We are a good team. I don't know anyone else whom I want to share the rest of my life with but you, Carrie. You make me realize all the stupid things I do which I know I am not perfect are learning experiences to make me as strong as you. I love you so much and can't wait to start this new journey with you. I am lucky to have you as my partner in crime and you mean the world to me" Sidney said as tears filled his eyes. "Carrie its your turn now" the minister said. "Sidney, you started off as my best friend and will always be my best friend. We have been through many ups and downs but in the end we were there for each other and that's what counts. You make me laugh and cry but I know its for the best. You are an amazing father to Ava and Aaron and you make me a better mother to them too. I love you and you are my heart forever" Carrie said as she started to cry. "Can I have the rings please?" the minister asked Colby who handed him both rings. "Sidney repeat after me. 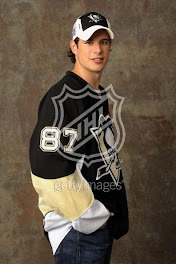 I, Sidney Patrick Crosby, take Carrie Jocelyn Addison to be my lawfully wedded wife. To have and to hold from this day until forever." my lawfully wedded husband. To have and to hold from this day until forever." "Now Sidney please give Carrie her ring and Carrie please give Sidney his ring" the minister instructed. "Now by the powers vested in my by the province of Nova Scotia I now pronounce you husband and wife. Sidney you may kiss your bride" announced the minister. Sidney wasted not time and kissed Carrie deeply. Then they turned as the minister said, "May I present to you all, Mr. and Mrs. Sidney Crosby!" Sidney and Carrie walked down the aisle, smiling at everyone. When they got to the lobby Sidney kissed Carrie again just for hell of it. The reception was lots of fun and pictures were being taken by this amazing photographer that Trina knew. The food was great and Carrie and Sidney were constantly on the move during the reception but finally Natalie got them settled so they could eat and relax. Fun times were had by everyone. Finally it was time for Sidney and Carrie to head off onto their honeymoon. Sidney's parents were going to take care of the twins so Carrie and Sidney could actually have a honeymoon. They were going to the Caribbean to a very nice resort and spa. Both of them were very excited to get away and relax for a week and a half. Carrie and Sidney gave everyone hugs and kisses and then got into the limousine that would take them to the airport. Carrie threw her bouquet before she got into the car and Vero actually caught it and Marc Andre just shook his head. Once Sidney and Carrie were in the limo, Sidney turned to look at Carrie, "Hey we did it. Can you believe it?" "I can and I can't. It just seemed so amazing and it went by so fast but I am happy and I love you, Mr. Crosby" Carrie said smiling at him. "I love you too Mrs. Crosby" Sidney said as he leaned over to kiss Carrie.